Even though hedgehogs are not typically described as “chewers” it is possible they can chew electrical wires, so it is a good idea to keep them away from your hedgehog while it is playing. 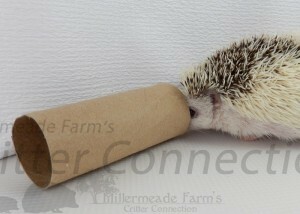 Your hedgehog may be litter box trained, but it is also likely to potty anywhere outside the cage when it gets the urge. Make sure the floor can be easily cleaned and that there are no climbing objects, such as books or magazines, which can be ruined if they get soiled or wet. Some owners recommend no less than 30 minutes of supervised free roaming time in a hedgehog safe room or enclosed area.